If all goes well, commuting from the Bengaluru city to Kempegowda International Airport could take just an hour and also be hassle-free as the airport operator, Bangalore International Airport Limited (BIAL), and the South Western Railway (SWR) authorities are actively considering a halt for trains that pass through Devanahalli. After alighting from the train at a ‘halt’ near the airport, passengers should be able to walk to the airport. At a press meet here on Tuesday, Bhaskar B., Senior Director – Finance and Support Services, BIAL, said there is 4,000 acres of land within the KIA compound where a railway station can be constructed. The land is three kilometres away from the trumpet interchange (road leading to the airport). “We have no problem providing land for the railway station,” he added. This was a response to Anil Kumar Agarwal, Divisional Railway Manager, South Western Railway, Bengaluru, who said Railways wants a ‘halt station’ close to the airport. If a halt is provided near the airport, it will benefit passengers from other cities in Karnataka such as Mysuru, Mangaluru, Hubballi and Tumakuru. At present, they alight at the Bengaluru City Railway Station and then proceed to the airport by road that is choked with traffic. Anup Dayanand Sadhu, Senior Divisional Manager (Commercial), Bengaluru, SWR, said BIAL authorities will first have to send a proposal about construction of a railway station near the airport to the South Western Railway. Once that is approved, the modalities will have to be worked out. This is awesome to hear - long overdue and stupid on the part of the city/ airport not to push for this right from the start. The last mile from the boundary to the airport itself should be worked out - and hopefully have a free shuttle offered by the airport (or cheap tickets). Kempegowda International Airport (KIA), Indian Air Force (IAF) and Hindustan Aeronautics Limited (HAL) are working on resolving possible airspace conflicts after the second runway at KIA becomes operational. To keep pace with air traffic growth, Bangalore International Airport Ltd (BIAL) has started work on a second runway at KIA. Operations from the second runway may impact training at the Air Force Station in Yelahanka. Transport and helicopter pilots are trained at the Air Force Station. It is one of the most active air bases in the country and also the venue of the biennial Aero India airshow. “Operations on the second KIA runway may impact helicopter flying which is conducted north of the Air Force Station runway,” a source told Express. A Joint Working Group (JWG) comprising IAF, HAL and BIAL representatives has been formed to and resolve all airspace conflicts. The issue had been discussed at the JWG meetings earlier. In the next few days, the group will have a series of meetings to deliberate on Air Traffic Service (ATS) procedures, airspace boundaries and other related issues. The JWG is in the process of identifying an aviation space management company which would give expert advice on optimum exploitation of the available airspace without any conflict. The agency will study air traffic patterns and make suggestions to the group. According to a BIAL official, work on the second runway has started and it is likely to be operational in 2016. Good - this type of coordination is needed to prevent any confusion on the airspace and who controls what parts of it. Next time, if your child forgets to bring an identity card to the airport, don't worry. Officers of the Central Industrial Security Force (CISF), which handles security of airports, said that norms for document verification at airports have been simplified and people, travelling in groups, especially families, must show only one identification card to enter the airport. The move comes with a rider: such leniency will be based entirely at the discretion of the officer on the ground. Air travellers have responded positively. "We're glad the CISF is being practical. Once I had to run from pillar to post as the identity card of my mother was not acceptable to the CISF personnel. This move will benefit a lot of people," said Rekha Panikar, a publisher and frequent flyer. Until now, the Bureau of Civil Aviation Security (BCAS) has mandated a government-approved identity card for any person who enters the airport. There have been several incidents in which passengers were not allowed to enter even though they had valid flight tickets but no ID proof. Recurring complaints have led to this change. Hemendra Singh, deputy commandant, CISF, Delhi told TOI: "There was a circular about this change a few months ago. When a family member comes to the airport without valid ID proof, she can be allowed provided any other family member comes with a valid identity card and the officer is convinced she belongs to the family. It's our responsibility to implement the BCAS guidelines." CISF officials at the Kempegowda International Airport confirmed the change but said the officer on duty will be given more powers to make a decision. "Our men are experienced and can identity genuine cases in which leniency can be shown. Going by the book and BCAS guidelines, we'll have to ask for ID proof for an infant too which is impractical," a KIA official said. Details of the new pay in lounge and day hotel at KIAL. This facility is before security check. Ha ha ha ha ha ha ha ha , Hilarious! additional guest during the shower ????? 30-minute seated massage with shower?? Wonder how this is going to work. My dirty mind is running riot with the possibilities. Similar to our immigration chaps .... some allow families to go together others demand one by one. How hard is it to apply common sense and not let individual egos/power trips come into the picture. Silk Air A320 AOG at BIAL? Can see it parked at a remote stand. Common sense? Everyone needs an id. If you dont have one you have to go through extra security. Shouldnt that be commin sense or if so employee says its ok? Everyone needs and ID and if you don't have one, you shouldn't be flying. period. It is that simple, common sense or not. Bangalore Kempegowda International Airport introduced Al Nassma camel milk chocolate products at its Nuance duty free outlets in partnership with Dufry (The Moodie Report/DFNI, 20-Nov-2015). The launch marks Al Nassma's entry into the Indian travel retail market. First of all apologies for the late (late) reply .... didn't notice this at all. Almost a year late hehehehe. Anyway- I didn't say anything about not needing an ID to fly We are talking about entering the terminal. The BCAS rules of terminal entrance are not safety related (thats the excuse tho) and if a family comes to drop off a relative why ID everyone? And why should it be up to the individual on duty? Karnataka's High Court dismissed petitions calling for the resumption of commercial operations at HAL Bangalore International Airport (DHNS/The Hindu, 16-Dec-2015). The Court stated it cannot intervene in a government policy decision to suspend operations at the airport following the opening of Bengaluru Kempegowda International Airport. I see that the work on the second runway has begun. Any idea when it is expected to complete? Bengaluru International Airport, which saw change in ownership recently, has concluded the runway upgradation work. The airport announced the increase in runway capacity to 38 Air Traffic Movements per hour as compared to 34 prior to the commissioning of two Rapid Exit Taxiways (RETs). The work which was carried on from January 2017 until August 2017 involved closure of operations from 1030hrs to 1700hrs between 19th February 2017 and 30th April 2017. The airport has been growing fast in line with the growth in the country and recorded 22.18 million passengers in 2016, a growth of 22.5%. The Air Traffic Movements increased by 19.9%. GVK which built the greenfield airport and operationalized in 2008, recently sold its residual stake of 10% to Fairfax India, months after earlier agreeing to sell 33% stake in March 2017. The increase in movements will largely help AirAsia India which started its India operations from Bengaluru. The airline has started inducting capacity in its quest to reach 20 aircraft at the earliest and start flying international. Vistara – the TATA-SIA Joint venture which became the fourth airline in the country to operate the A320neo, recently increased frequency between Delhi and Bengaluru to five flights a day. Vistara could look at additional flights from Bengaluru with the availability of slots. IndiGo – the largest airline in the country by market share has been plagued by issues with the Pratt & Whitney engines on its A320neo aircraft and has struggled to expand in the last few months. The airline has reported grounding of aircraft and it is running a truncated schedule currently. With the end of the engine woos nowhere in sight, a big bang expansion will definitely be on hold. The airport is also constrained for parking bays and terminal capacity and significant change would take place in later half of 2019 when the second runway will be commissioned. The airport is unlikely to see full-fledged dual runway operations until 2020, since the current runway is likely to be closed for upgradation when the secondary runway become operational. The airport has seen runway closure in 2012 for 24 days for resurfacing the runway. Jet Airways which had announced that it would make Bengaluru its third hub after Mumbai and Delhi is one of the first to take advantage of the increase in capacity. 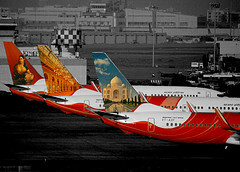 The airline is launching two daily flights to Lucknow and re-instating flight to Goa. It is also re-jigging flights on Bengaluru – Kolkata – Guwahati to operate as Bengaluru – Kolkata – Silchar – Guwahati and add third daily Delhi – Guwahati – Delhi flight competing with low cost competitors IndiGo and AirAsia India. The new flights include direct non-stops between Bengaluru and Patna and 4th frequency between Bengaluru and Kolkata. The airline is inducting a few B737-800NG aircraft from the lease market to expand till it starts getting the B737MAX8 later next year. Jet Airways starts flights to Amsterdam from Bengaluru in October and has started flights to Colombo and Singapore recently. However, the domestic additions do not give good connections to the international flights as yet since they are not part of the bank structure at Bengaluru unlike Delhi or Mumbai. Aero India the biennial air show and aviation exhibition will be held at Air Force Station Yelahanka in Bengaluru from 20th to 24th of February. Like its previous editions, the air show will lead to air space closure at Bengaluru and disrupt the schedule of flights for five days of the airshow and the days leading to the airshow. The sole runway of the airport will be closed for all movements between 1320 – 1630 hours from 14th to 17th February. The close will be from 0950 – 1200 hours and 1350 – 1700 hours on 18th, 19th, 21st, 22nd, 23rd and 24th of February and on 20th February the airport will remain closed from 0850 hours to 1200 hours and 1350 to 1700 hours.